He focused on the central role of energy exports to Baku’s grand strategy, which is based on close relations with the West and a strategic partnership with Turkey. As a former Russian and Soviet-occupied “captive nation,” Azerbaijan thus hopes to counterbalance Moscow’s attempts to rebuild the empire by striving to weaken Russia’s efforts to monopolize energy exports to Europe. Another, and perhaps even more important goal of Baku, however, is to isolate Armenia. Historic tensions and enmities between the Azeris and Armenians have been exacerbated by the war for Nargorno-Karabagh/Artsakh after the implosion of the Soviet Union and more recent incidents, such as Baku’s celebration of an Azeri officer who murdered an Armenian officer in Hungary with an axe several years ago. Because of the conflict over Nagorno-Karabakh, Turkey, as an ally of Azerbaijan, has closed its border with Armenia, thereby imposing a dual blockade on Armenia from east and west. This is part of the two countries’ isolation policy vis-à-vis Armenia. Armenia’s close relations with Russia and Iran, in turn, make Azerbaijan feel quite uneasy and surrounded, thereby creating a vicious cycle that will be very difficult to resolve in an amicable manner. Armenia is the greatest negative target of Azerbaijan’s public diplomacy campaign on the international stage, which is fueled by revenues from energy resource exports. However, Mr. Khlgatyan pointed out, an overreliance on petro-dollars can ultimately weaken Azerbaijan’s economic prospects and make it a victim of the “Dutch Disease.” The fact that Azeri oil reserves in the Caspian Sea hit their peak in 2010-2011 may eventually undercut Baku’s grand strategy. For Armenian commentary on the event, please see Armenpress or HETQ. We have been unable to locate any Azerbaijani perspectives on the lecture. Vilen Khlgatyan is Vice-Chairman of Political Developments Research Center (PDRC), a virtual think tank based in Yerevan, Armenia. He attended Webster University, where he double majored in International Relations and International Business, and graduated in Spring 2010. He spent a semester studying in Vienna, Austria, where he also attended OPEC and OSCE workshops. 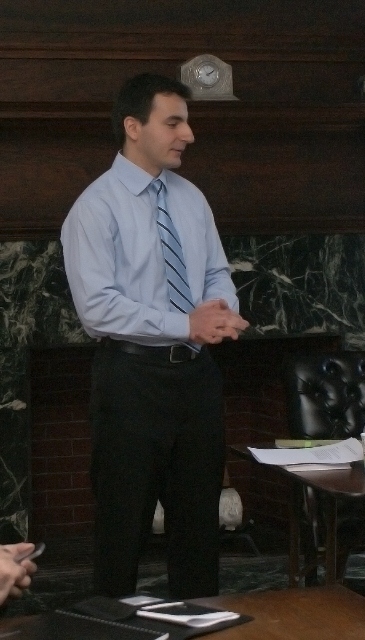 Mr. Khlgatyan was a campaign staffer for Congressman Russ Carnahan of Missouri’s 3rd District, who sat on the House Foreign Affairs Committee. This entry was posted in Events, Past Events and tagged Armenia, Azerbaijan on March 22, 2013 by IWP.